A particular calling consists of the specific tasks and occupations that God places before a person in the course of daily living. It focuses on, but is not limited to, the work that a person does for a livelihood. Several important corollaries follow from this doctrine of vocation, [three of which are listed here]. · Since God is the one who calls people to their work, the worker becomes a steward who serves God. · [T]he Puritan view that God calls all workers to their tasks in the world dignifies all legitimate kinds of work. Above all, the Puritan doctrine of vocation sanctifies common work. · The Puritan doctrine of vocation (inherited, we should note, from Luther and later Continental Reformers) integrated life in the world with the spiritual life. We need, of course, to draw a distinction between the original Puritan work ethic and the secularized perversion that followed. The original Puritan work ethic was this: “Be laborious and diligent in your callings … ; and if you cheerfully serve [God] in the labour of your hands, with a heavenly and obedient mind, it will be as acceptable to him as if you had spent all that time in more spiritual exercises” (Richard Baxter). C. S. Lewis wrote enthusiastically of “the beautiful, cheerful integration of [William] Tyndale’s world. He utterly denies the medieval distinction between religion and secular life.” Such integration is one of the most attractive features of the Puritans. Their goal was an ordered and disciplined daily life that integrated personal piety, corporate life, everyday work, and the worship of God. 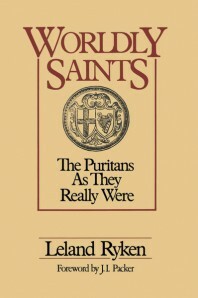 For more on the Puritans, the place to start is Leland Ryken’s Worldly Saints: The Puritans as They Really Were. Ryken corrects many of the myths about the Puritans without glossing over their faults. “The Original Puritan Work Ethic” was published in Christian History & Biography magazine and is available here.